Doc Converter converts Doc/DocX/TXT/DocM files to PDF, HTML, XLS, JPG, TIFF, or Text. The program preserves original document`s layout as well as document properties. Transparent interface makes it easy even for a beginner to figure out how it works. Doc Converter converts Doc/DocX/TXT/DocM/RVF files to PDF, HTML, XLS, JPG, TIFF, or Text in batch. It preserves original document`s layout as well as document properties. Total Doc Converter is very flexible and has lots of different settings to achieve perfect results. Transparent interface makes it easy even for a beginner to figure out how it works. 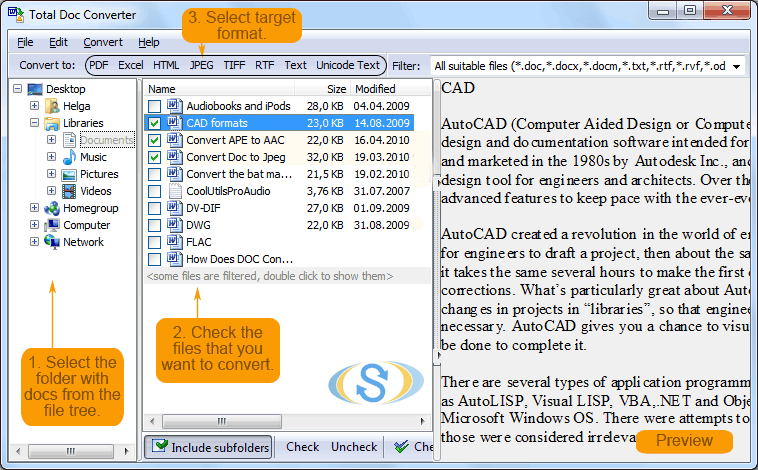 Download your free trial copy to professionally convert DOC files via GUI or command line. Import one or many web site(s) into a blank MS Excel file. Specify URL(s) and either INSERT them all into one sheet or individual sheets per file. Excel 2000 or higher required. With pdf-DocPro Server Edition you are able to set all PDF document and presentation properties on user�s computer with some few clicks - in series !